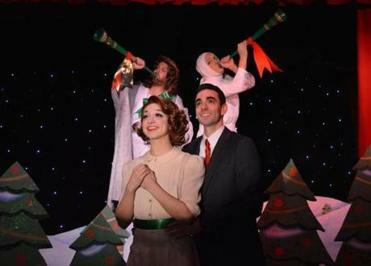 Jessica Barstis and Paul Melendy in Ryan Landry’s holiday parody featuring the Gold Dust Orphans. Perhaps you’re already gritting your teeth as you brace for the coercive blizzard of good cheer the holidays invariably bring. Perhaps you don’t want to feel merry and bright. Perhaps you’re feeling a little subversive about it all. In that case, have I got a show for you. Master parodist Ryan Landry has already given the sentimentality of Charles Dickens a good thrashing with “Mrs. Grinchley’s Christmas Carol.’’ Now it’s Frank Capra’s turn. 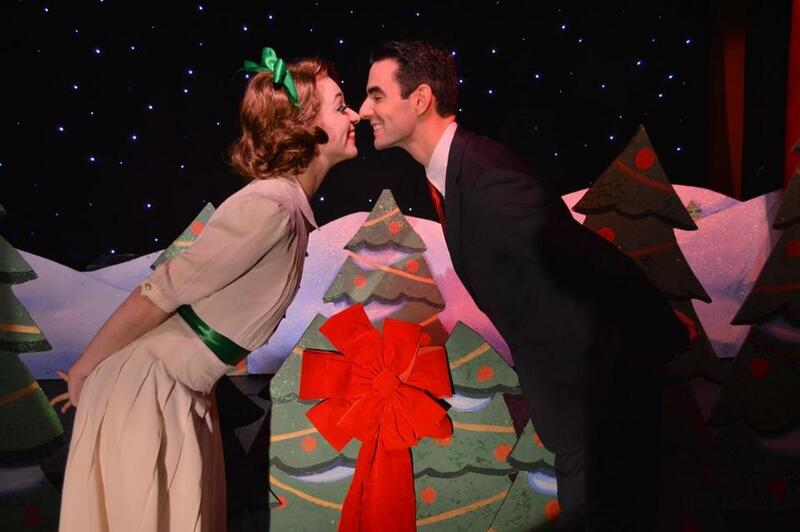 Landry brings back the mean, green, and thoroughly obscene Mrs. G. for “It’s a Horrible Life,’’ a fun, freewheeling, through-a-glass-Grinchley sendup of “It’s a Wonderful Life’’ in which nothing is sacred (quite literally). Now at the Machine nightclub through Dec. 22 under the adroit direction of James P. Byrne, “It’s a Horrible Life’’ of course features members of Landry’s redoubtable troupe, the Gold Dust Orphans. But it’s perhaps most notable for the showcase it provides to Paul Melendy, performing with the Orphans for the first time. Melendy delivers a performance as George Bailey that is a small gem of comic virtuosity. He drawls and stammers and channels James Stewart’s aw-shucks persona to perfection. Ryan Landry’s latest, “It’s a Horrible Life,” the raunchy-yet-affectionate musical parody of Frank Capra’s 1947 Christmas classic, has a certain Capra-esque spirit behind it. Broadly speaking — very broadly — Landry’s script follows the familiar contours of “It’s a Wonderful Life.’’ George desperately wants to leave Bedbug Falls (as it’s called here), to “shake the dust of this crummy town off my feet and see the world,’’ but the call of duty keeps pulling him back. After all, without George around, it will be all the easier for Mrs. Grinchley to get her claws on the Building & Loan Association. Also keeping George in town: the alluring charms of the fetching Mary, well played by Jessica Barstis. But events conspire to wear George down, leading him to the brink of suicide. In an inspired touch by Landry, the guardian angel tasked with showing George what the world would be like if he had not been born and proving that his life is indeed wonderful, is not Clarence but Little Edie, from “Grey Gardens.’’ She is portrayed by Orphans regular Olive Another, hilarious as usual, attired in a white head wrap. Before Edie comes down to earth, she surveys and comments on the action (in a Long Island accent) while standing next to none other than Jesus (Gene Dante). A kind of one-man showbiz archive, Landry has stocked “It’s a Horrible Life’’ with his usual array of visual, verbal, or musical allusions, not just to “Grey Gardens’’ but also “A Chorus Line,’’ Disney’s “Beauty and the Beast,’’ 1950s rock ’n’ roll, 1940s swing (a nativity scene sung and danced to the tune of “Boogie Woogie Bugle Boy’’ is a high point of the show), Miley Cyrus, and Liberace. Landry also has a pronounced, and mischievous, sense of place, so he throws in a biting reference to Boston’s Club Cafe and includes a walk-on by actors playing Barry and Eliot, from Jordan’s Furniture. Local music fans will smile at the name Landry has given Mary’s word-mangling mother: Skippy White. finale, darned if I wasn’t starting to feel sort of merry and bright.